Collaborative Craft Team Volunteers: Resolutions for 2013! 1. Keep up to date with the blog - I hear you laughing! 3. Be more active - attempt (another year!!) to lose weight. Over Christmas/New Year I was meeting myself coming back and this is exactly how it felt!! I just needed some time to site and slosh paint on paper, to cut out, glue and stick....It's so relaxing, you can just lose yourself in it all. My experimental journal consists of lots of unfinished pages but I quite like it like that - always something to go back to. My pages start off in several different ways. Cover your pages with a layer of Gesso. This is your basecoat or primer and then you can add furhter layers of paint or inks. 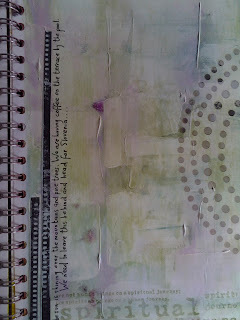 I apply my Gesso either with a paintbrush or in my favourite way with an old credit or store card. 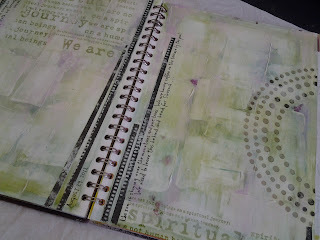 by scraping in different directions, I achieve these textured ridges which I love. After the Gesso is dry, I apply layers of colour. 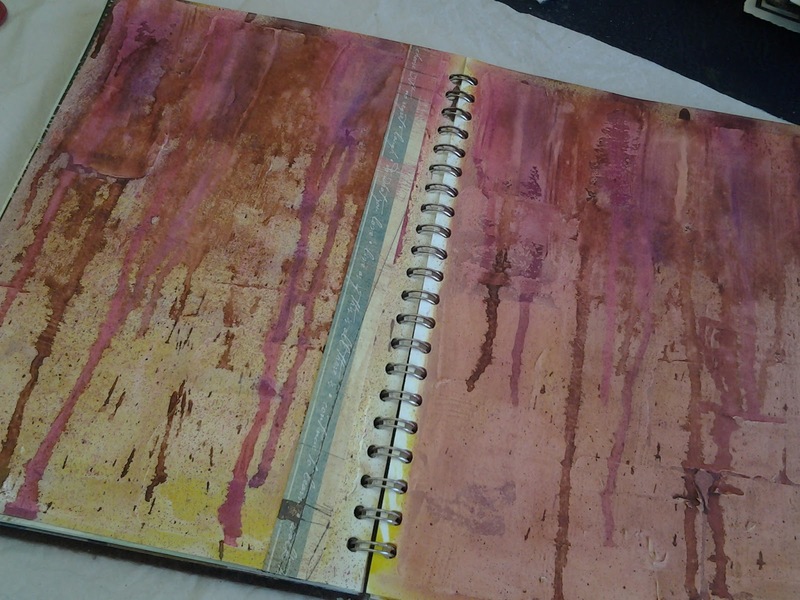 Spray inks are good and I also use distress inks applied with the blending sponge. 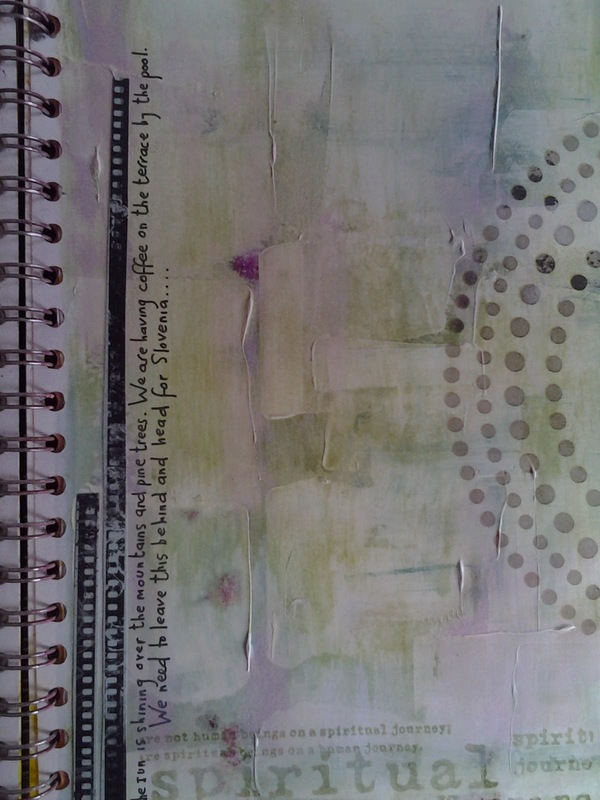 I use stencils with contrasting colours. 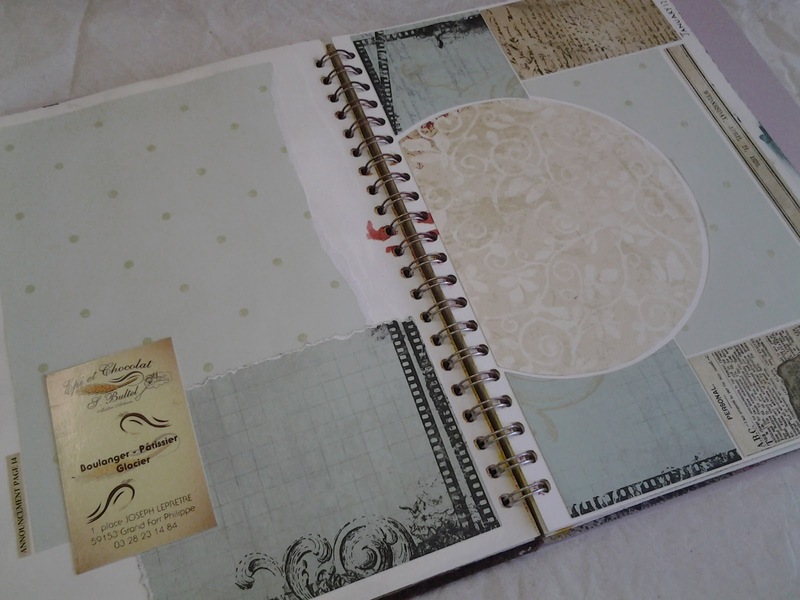 We have all got stashes of old background papers so dig them out and stick them down on your journal pages. A layer of colour already. You can also use:- old tickets/receipts, old book pages, music scores, pages from glossy mags, sweet wrpappers, envelopes and photographs. Here I have used a paper bag my croissants came in! The list is endless....Don't worry if it is not perfect - just work with it until you achieve a look that you like. There are no rules. Your journal is pesonal to you. Our "Play Day" on Saturday 2nd February is foucused on "journalling". If you have your own tips and techniques come along and share them with us - if not come along anyway to see the wide range of different pages. These pages look great Carol - Your playdays keep clashing with my scrapbooking crop or I'd be there every time! It's lovely to have some comments...thank you ladies!